8vo., (4) 155 (1)pp., including the half-title, the paper generally rather browned, half-title and final page (errata) soiled, with a slightly cropped ms presentation inscription on half-title ("Captain Davis with Mr. Keate's complim...."). A good copy recently bound in linen-backed marbled boards lettered. Although Thomas Keate (1745-1821) was a distinguished London surgeon, succeeding John Gunning in 1798 at Surgeon-General to the Army, and being elected F.R.S. the following year, he seems to have rubbed up the military hierarchy the wrong way. He had published in 1808 his Observations on the Fifth Report of the Commissioners of Military Enquiry, a report which had censured the medical board for showing a lack of proper control, for irregularities in awarding promotions, for making new and unnecessary appointments, for waste and extravagance, and for opening general hospitals unnecessarily. Keate had carried out his duties with success but blame had nevertheless fallen on him. The board was dissolved in 1809 and Keate was retired with a small allowance. The present Observations are in a sense a continuation of his 1808 Observations on the Fifth Report, although evidently particularly examining the inspection of the Military Hospital on the Isle of Wight and both the clinical and administrative management of the hospital by the medical superintendent, Dr. Jackson, who it seems, had made in his evidence a number of "misrepresentations and calumnies" about Keate. Dublin: Irish Society of Artists and the Royal Hibernian Society, 1809-1853, 1809. First editions. OCLC records three of the catalogues; two of those in single copies only, both at the V. & A. Museum. Minor stains and wear; overall in very good condition.. 11 vols, 4to, self- and printed wrappers, stitched as issued, untrimmed. 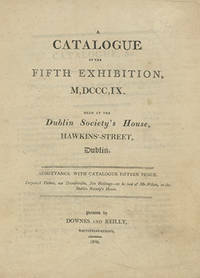 A fine accumulation of annual catalogues issued by The Irish Society of Artists (the first three catalogues, 1809-1813) and the Royal Hibernian Academy (the following eight catalogues, 1827-1853) each with lists of exhibitors, titles of their works of art, members of the society, officers, occasional pronouncements, guidelines for the artists, etc. Among the works exhibited were paintings, sculpture, architectural models and designs, and engravings. Some of the works that depict famous scenes from literature are accompanied by quotations from those works. The Irish Society of Artists morphed into the Royal Hibernian Academy in 1821 when the latter was granted a Royal Charter, and it is still in healthy operation today. Mr Telford's Report and Survey, Relative to the Communication between England and Ireland by the North-West of Scotland. WITH. Charts and Plans. TELFORD Thomas 1757-1834. McKERLIE John 1775-1848. [London]: The House of Commons, 1809 2 vols - The Charts & Plans with The Report, complete, 16 large plates, VG, 1st ed. Charts & Plans, 54*68 cms (small double elephant), in modern half calf with contemporary marbled boards, some blind tooling, paper title, board edges a little bumped. Spine, gilt tooling & titles. Internally, title page with title & plate list within double ruled borders, 16 large, double page, folding plates of engraved maps, plans, elevations and sections, including a general map of the routes between Carlisle and Belfast, detailed plans of proposed harbours, new roads and bridges, including 7 of which are partly hand coloured, leaves water marked 1801, some very minor toning & spotting, some creasing, small paper repairs to head of tp, some of the plates are 140*63 cms! 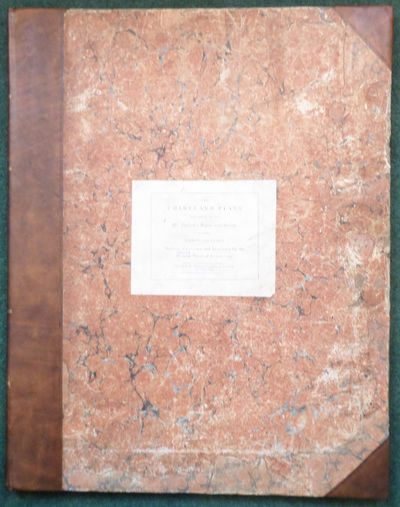 The Report, 34.6*22cms (Tall Folio), in modern blue paper wraps, white paper label to upper cover, , 3-75 pp, , , paper watermarked 1804, t.e.g., first 4 leaves have contemp. ink numbering to top corner, contains the report pp 3-5 & The Appendix pp 7-75. Printed by L. Hansard & Son for the House of Commons. (Parliamentary Papers, 1780-1849, Vol 52, Part 7, 26 - Repot, 1809). Telford, civil engineer, whose main achievements in road making were the London to Holyhead and Bangor to Chester roads as engineer to the Holyhead road commissioners from 1815, and the Glasgow to Carlisle, Lanarkshire, and highlands of Scotland roads as engineer to the highland roads commissioners from 1803. See ODNB. M?KERLIE who in 1806 as a Rear-Admiral M?Kerlie, was instructed by the Admiralty to assist Mr. T. Telford, a Civil Engineer, in making a survey of the line of communication between the north of England and the north of Ireland, and also in surveying the harbours on each side of the Channel. [London: William Miller, 1809. Very Good. Hand-colored aquatint print now in a modern frame under glass. Image size approximately 61 x 42cm. Plate No. XV from "Twenty-Four Views in St. Helena, the Cape, India, Ceylon, Abyssinia and Egypt" which was published in 1809. Hofer, Andreas, Tiroler Freiheitskämpfer (1767-1810). Innsbruck, 20. IX. 1809. - 3½ SS. 8vo. Bericht "An Seine Kaiserliche Hochheit den allgeliebten E.H. Johann etc." mit der Bitte um Beistand und Instruktion: "Der Wunsch der in meiner Brust herrscht Euer Kaiserliche Hochheit bald zu sehen ist mit Worten nicht auszudrücken. Unser Elend war groß - äußerst groß, aber Gott war mit uns, augenscheinlich - wenn man betrachtet, selbst von denen auf die ich anfangs mein Vertrauen setzte - war ich verlassen, alles verließ mich, kein Militaer kein Geld etc. kurz von allem verlassen. Allein ich vertraute auf Gott, und unsern allgeliebten Kaiser! und wir waren endlich mit Gotteshilfe so glücklich das liebe Vaterland von dem alles verheerenden Feinde zu befreyen. Aber an manchen Orten sieht es sehr traurig aus - wenn man die so vielen Brandstätte, Plünderungen und Mißhandlungen betrachtet. Allein so groß das Elend ist - noch viel größer wird die Freude seyn, wenn wir uns wieder in den Armen unsers allgerechten Kaisers fühlen, alle Unglücke so groß sie immer waren, werden auf einmal vergessen seyn! - Auch muß ich Euer K. H. melden, daß sich Zillerthal, Pinzgau, Brixenthal und Bongau an uns angeschlossen haben. Sie sind bereit mit Tirol zu halten. Ich mußte aber denselben versprechen, daß sie mit Tirol auf immer vereinigt bleiben - ich versprach es denselben, und es sind bereits die Urkunden gegen einander ausgewechselt worden. Die Leute kamen beständig und hielten an, und ich versprach es ihnen, weil ich es für das Land nützlich fand. - Ich muß schließen den[n] ich würde kein End finden, und ich hoffe mit Hochselben in Kürze wenn es anderst der göttliche Willen, das Mehrere mündlich zusprechen. Aber noch eins - den Geldmangel werden E. K. H. Ihnen leicht vorstellen können - ich bitte dahero dringend um Unterstützung, machen E. K. H. nur daß wir Geld bekommen damit man doch einmal die Leute nur ein wenig unterstützen kann. - Uibrigens hoffe ich daß Sie uns in Kürze erlösen und wir Hochdieselben in unserer Mitte persönlich sehen werden. Gott gebe es - An meiner und des ganzen Landes Treue zweifeln Sie nicht, wir sind bereit den letzten Mann zu opfern. Ich muß auch noch fragen was mit denen verdächtigen Personen zu thun sey? ich habe selbe einmal in Arest gesetzt - und bin Willens jene welche ich wirklich für schuldig finde, kurzen Prozess zu machen. Ich bitte nochmal - säumen Sie nicht uns zu Hilfe zu kommen, in dieser getrösten Hofnung bleibe ich [.] P.S. Auch bitte ich nebst den andern schon verlangten Generalen mir den General v. Fenner zu schicken." Hofer zeichnet "Ich warer auf/richtiger Dien/er Hr. Andere Hofer / Ober commendant / in Diroll". - Etwas fleckig, einige bis in den Text reichende Bugfalteneinrisse. Der Name mit späterer Kugelschreiberanstreichung. Detail of a Plan for attaching to Cavalry Regiments a Proportion of Rocket Artillery, with Case Shot, containing the same Number of Balls as the Six-Pounder Spherical Case, and ranging 2500 Yards. Two folding engraved plates. 10 pp. 4to, attractive antique diced half-russia & marbled boards, spine gilt. London: J. Whiting, 1809. First edition. Congreve (1772-1828), is best known for creating the first rocket weapons system and initiating the modern processes of research and development in rocketry. His greatest interest was in "improving and perfecting the rocket as a military weapon. England subsequently adopted 'Congreve rockets,' which were used with great success against the French at Boulogne, Copenhagen, Leipzig, and elsewhere. They were copied by most European armies by 1830. "-D.S.B., III, p. 388. 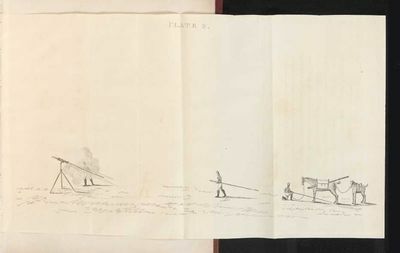 Here, Congreve makes clear that rockets were highly mobile and could be easily transported and employed by cavalry. Fine copy and rare. .
London: Published as the Act Directs for Thos. Daniell, Howland Street, Fitzroy Square, 1809. 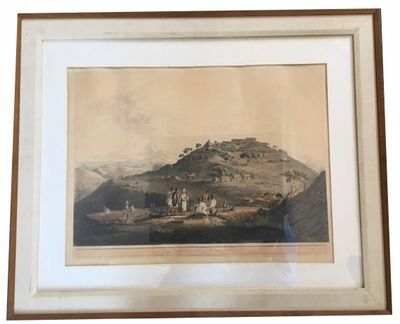 Aquatint by Thomas Daniell after James Wales, coloured by hand, on 'Whatman' wove paper. A stunning view of the Dhumar Lena at Ellora Mountain, a cave-temple dating to the 6th century This is one of the earliest caves of the Hindu series at Ellora and dates from the Kalachuri period in the early 6th Century, as denoted by the similarity between its columns and those at the Elephanta cave. Two sculptures of lions guard the south entrance and large-scale sculpted wall panels on the sides represent Shaivite myths. It was engraved by Thomas Daniell after the drawing by his friend, James Wales, and was included in Oriental Scenery as a sixth volume. The Daniells' Oriental Scenery is considered one of the finest illustrated works on India. Thomas Daniell and his nephew William spent nine years in India making studies, sketches and drawings of the scenery, architecture, and antiquities that graced the countryside. They then devoted a further thirteen years to publishing their remarkably accurate aquatints. In Britain, the impact was explosive. A cult of Indian architecture, landscaping and interior decoration arose, with the Royal Pavilion at Brighton as its centerpiece. The Daniells gave the English public their first accurate look at the exotic sub-continent. Their great achievement still lies in their ability to blend the picturesque with the real, resulting in images that capture the European taste for the sublime landscape, while still remaining faithful to their subjects. The Daniells brought the romance of the English landscape to the antiquities of India and provided England with an accurate vision of this wondrous country. 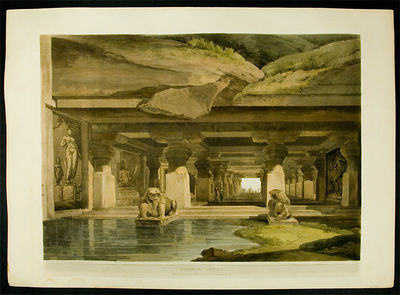 The sixth part of Oriental Scenery is twenty-four plates based on drawings by James Wales, primarily of the excavations at Ellora. The title of this section was Hindoo Excavations in the Mountain of Ellora , near Aurungabad in Decan... The mountain contains 34 "caves" that were created to serve as monasteries and temples for Buddhists, Hindus and Jains, each religion having several spaces. The present image is of "one of the earliest of the Hindu series [of cave-temples, which] is assigned to the 6th-century Kalachuri period ... The Dhumar Lena is ingeniously cut into the hillside so as to create multple entrances, with light flowing in from three directions." ( India yesterday and today p. 198). Martinelli and Michell, India: Yesterday and Today , p. 198, no. 131.Abbey Travel II 420, no.127; cf. Lowndes I, p.588; cf. RIBA 799-804; cf. Sutton The Daniells (1954) p.156; cf. Tooley 172. The Life of Admiral Lord Nelson, K.B. From His Lordship's Manuscripts. London: Printed by T. Bensley, For T. Cadell and W. Davies, and W. Miller,, 1809. 2 volumes, quarto (338 Ã— 272 mm). Contemporary full green straight-grained morocco, flat bands, title gilt direct to the spines, compartments with nested concentric gilt panels, wide arabesque rolled panels to the boards enclosing ruled and foliate panels in blind, dog-tooth edge-roll, all edges gilt, dog-tooth roll to turn-ins, dun endpapers. Frontispiece and 3 other plates to volume I, 7 plates to volume II, 4 of them accompanied by plans, headpieces, vignettes and facsimiles to the text, double page pedigree to volume I. Armorial bookplates of Anthony Cliffe of Bellevue, Co. Wexford to the front pastedowns, and his ownership inscription to the title page of volume I. A little rubbed at the extremities, a couple of minor scuffs to the boards, frontispiece slightly damped in the tail margin, light toning, a very good copy. First edition. "One of the main foundation stones of the Nelson legend" (Wilson, 'Nelson Apotheosised' in Cannadine (ed. ), Admiral Lord Nelson), "the 'official' biography" (NMM). M'Arthur, a former naval purser, had served with Nelson in the Mediterranean and had already begun collecting material for a biography when he saw "an advertisement in the papers announcing that the Nelson family had selected a gentleman 'of high respectability and rank' to write the life, and asking all who had letters Â… in their possession not to make their material available to anyone else." McArthur came forward claiming, groundlessly, that Nelson himself had asked him to write his life, and that he had already incurred considerable expense in preparing the book, including the commissioning of a set of paintings to be engraved as illustrations. An unseemly squabble ensued, the outcome of which was fairly inevitable in that Earl Nelson was under pressure from the Prince Regent to commission his librarian and chaplain, James Stanier Clarke, to write the book. It was agreed that the authors would pool their efforts, but not before they had further fallen out over whose name should come first on the title page. That we do not refer to McArthur & Clarke is a lasting memorial to the usefulness of a powerful patron. The finished work is wonderfully illustrated with anecdotal headpieces and plates by Westall and battle-scenes by Nicholas Pocock. The subscribers list is a remarkable directory of the great and the good of Regency Britain with an inevitable emphasis on naval notables. William Beckford took a copy on vellum - one of two "one of which was burnt" - Sir Home Popham and Admiral Keats proof copies, as also Admirals Cornwallis and Anson, Earl St. Vincent and Lady Hamilton. Thomas Masterman Hardy had an ordinary copy, as did the Sandwich Book Society and Leeds Circulating Library. Highly desirable thus. Verona, 8. V. 1809. - ½ S. 4to. In italienischer Sprache an den Anatomen Stephano Gallini (auch: Gallino). - Mit kleinen Randläsuren und leicht fleckig. EARLY ENGLISH. 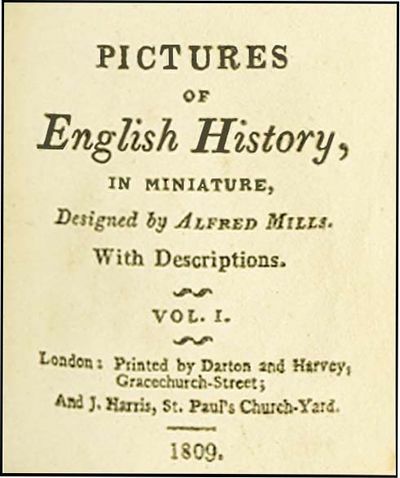 PICTURES OF ENGLISH HISTORY IN MINIATURE by Alfred Mills. London: Darton and Harvey 1809. 2 volumes each [ii] 96p., 2 1/4 x 2 5/8", period full black morocco with gilt design on borders, gilt spine and gilt turn-ins, all edges gilt. Except for a few uneven pages, near Fine in custom made morocco backed cloth box. First edition, illustrated with 96 especially well printed engraved plates. See The Dartons G652 listing copies in black leather and pink boards, attributing the text to Priscilla Bell Wakefield. This is a beautiful little set, quite scarce. IRVING, Washington (1783-1859) as "Diedrich Knickerbocker." A History of New-York, From the Beginning of the World to the End of the Dutch Dynasty, Containing Among many Surprising and Curious Matters, the Unutterable Ponderings of Walter the Doubter. Trattato di vaccinazione con osservazioni sul giavardo e vajuolo pecorino. The capital of the tycoon: a narrative of a three years' residence in Japan.London, Longman, Roberts, & Green (colophons: printed by Spottiswoode & Co.), 1863. 2 volumes. 8vo. With 2 chromolithographed frontispieces, 2 folding engraved maps (partly coloured), 14 tinted, double-tinted and chromolithographed plates, 2 black & white wood-engraved plates and numerous wood-engraved illustrations in text. Contemporary calf prize binding, richly gold-tooled spines, with the coat-of-arms of the Royal Naval School on the front boards. Cordier, Japonica, col. 556; Wenckstern I, 43. First edition of a famous work on Japan by Sir Rutherford Alcock (1809-1897), the first British consul in Japan, extensively illustrated with numerous chromolithographs and wood engravings. Alcock describes Nagasaki, Yokohama, a trip to Hokkaido and Japanese foreign relations, including differences between the U.S. Consul and the European Consuls. Alcock made many journeys during his stay in Japan, recording the manners and customs of the Japanese. Appendix E contains notes on agriculture, trees and flora by Mr. Veitch. A "classic work" on Japan.With lithographed prize certificate on paste-down. Map of Japan foxed and some spots in the margins of the plates, endpapers slightly browned, otherwise a very good copy. Binding very good as well, with only a few minor scratches. Memoirs of the Hon. Thomas Jefferson, Secretary of State, Vice-President, and President of the United States of America; Containing a Concise History of Those States, from the Acknowledgment of Their Independence; with a View of the Rise and Progress of French Influence and French Principles in That Country. London: R. Bagshaw, 1809. 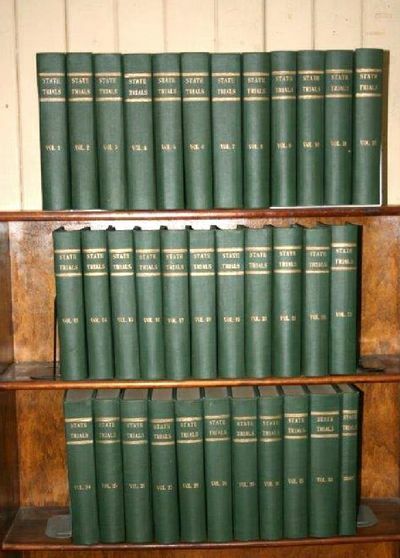 34 volumes (complete including General Index). Neatly rebound in dark green cloth with gold lettering on the spine. Octavo. Throughout the pages are clean and unmarked with only light toning and foxing and a random worm hole in a few volumes, none of which impacts the very clear and legible text. The diagram of the Court of Maidstone in Volume 27 is complete with a closed tear not affecting the diagram. A few volumes have bottom corners turned up. Some covers have a little shelfwear. Overall a very well-preserved, tight, clean and attractive set. The Fifth Edition printed between 1809 and 1826 (the General Index in 1828) is considered the best. It was originated by William Cobbett . The first 21 volumes report the most important trials from that against Thomas Becket, Archbishop of Canterbury in 1163 (Henry II) to to 1781 were edited by Thomas Bayly Howell. The remaing volumes bringing the trial down to 1820 were edited by his son Thomas Jones Howell. Published by R. Bagshaw (imprint varies). StateHoldsworth considered the collection of criminal, civil and constitutional cases to be an invaluable resource. State trials in England relate to trials relating to offenses against the state but includes law relating to state officers and international and constitutional law (Encyclopedia Britannica, 111th edition).. Fifth Edition. Hard Cover. Very Good. 8vo. Voyage en Espagne fait dans les années 1786 et 1787, par Joseph Townsend. 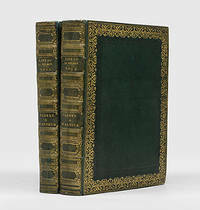 3 volumes sans l'atlas. Jefferson, Thomas, American Founding Father, the principal author of the Declaration of Independence (1776), and the third President of the United States (1801&#150;1809). ALS, as president, signed "Th. 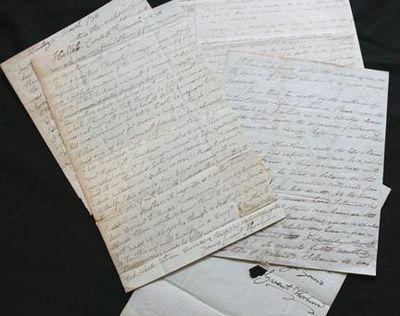 Jefferson,"
n.p., January 19, 1809 - 1 page, 8 x 9.75, Letter to his young cousin Richard Randolph: "I have duly received your letter of the 10th mentioning the invention of a bridle having the advantage of not going into the horse&#146;s mouth. You know of course you can have a patent for the use of it on the terms mentioned in the patent law. In the event of the Secretary of War&#146;s approving it, & wishing to make use of it, it would become a question whether he could give a price for permission to use it. I rather believe it would be lawful, but that he would venture to use it very moderately. If you should wish to try this latter experiment & would forward the bridle by the stage to me, I would submit it to his examination & take care that no use should be made of it injurious to your views. It would not at all be necessary for you to come here. Should the corps of volunteers proposed be raised, the appointment of the officers from field officers downwards will pretty certainly be referred by the President to the state executives. That is the quarter therefore to which your application will be to be made. I salute you with esteem & respect." In very good condition, with uniform overall toning, professional repair and reinforcement along bisecting vertical fold on reverse, and some mild edge chipping. The Randolph family is a prominent Virginia political family whose members contributed to the politics of Colonial Virginia and Virginia after it gained its statehood. The family married with members of the Lee, Washington, and Harrison families, and included notable members such as George Washington and Thomas Jefferson, Alexander Hamilton, John Marshall, Peyton Randolph, Alexander Stephens, and Robert E. Lee. Pocahontas was also directaly related to the Randolph family, and some evidence suggests that so too was Davy Crockett. Excellent association between Jefferson and his famous namesake. Tausend und eine Nacht der Gegenwart oder Mährchensammlung im Zeitgewande. 4 Bände (so vollständig). Plantes Usuelles, Indigènes et Exotiques, dessinées et coloriées d'après nature, avec la description de leurs caractères distinctifs et de leurs propriétés médicales. Seconde édition. Sammelband mit zehn Schriften zu Ludwig XVI. und Ludwig XVIII. FLASSAN, Gaëtan de Raxis de. Histoire génerale et raisonnée de la diplomatie francaise; depuis la fondation de la monarchie, jusqu'à la fin du règne de Louis XVI. Avec des tables chronologiques de tous des traités conclus par la France. Die Schönheiten der Königl. Kreisstadt Augsburg und deren Umgebungen in 49 bildlichen Vorstellungen mit Beschreibung. , in PhotoResearcher 17 (2012): 3-13, p. 11.- // VG+ for the body, G+ only for boards." Videnskaben om Naturens Almindelige Love. Første Bind (alt som udkom). (The Science of the General Laws of Nature. First volume [all that was published]). [New York]: Printed for the Purchasers, 1809. Hardcover. Complete 2-volume set. 8vo. Half calf and marbled paper over boards, compartments. iv, 404; 434pp. Very good overall. Mild occasional age toning, and some dampstaining to first few leaves of second volume; contemporary ownership signature (William Washington Jr.) penned on title page of both volumes, and this same owner underlines words and phrases sporadically throughout both volumes, also adding the occasional minor margin note. First edition. Altogether a tight and quite handsome set of this early biography. Notes Wright Howes: "Venomously critical; said to have been suppressed for fear of libel suits." Very scarce -- and with a distinguished provenance, coming from the collection of ADLAI E. STEVENSON III (b. 1930), former U.S. Senator, and certainly come to him from the collection of his father, ADLAI E. STEVENSON II (1900-65), two-term Illinois governor and twice presidential candidate; and possibly come to him in turn from his grandfather, ADLAI E. STEVENSON I (1835-1914), vice president of the U.S. under Grover Cleveland. HOWES C 167. A TREATISE OF ALGEBRA. First American, from the Eighth London Edition. 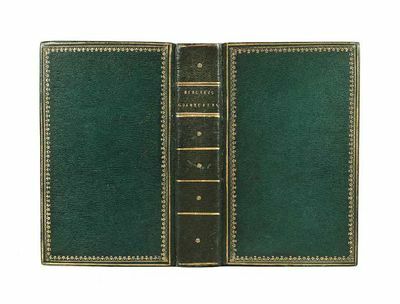 Philadelphia: Published by Mathew Carey, 1809. viii,136pp. plus six engraved plates. 12mo. Original plain paper boards. Boards rubbed and edgeworn, spine rubbed and chipped. Tanned, some foxing. Two early plates and three early text leaves stained. Good. Prints humorous works by Pindar, Freneau, Ladd, Swift, Dibdin, Pitt, and others. 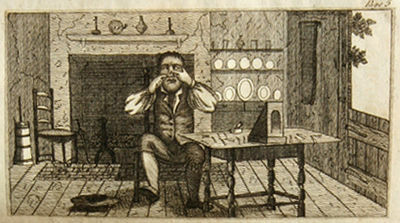 One of the earliest printed collections of American humor, and scarce. SHAW & SHOEMAKER 17136.
presso Lorenzo Lazzari alle Convertite 1809 4to oblungo (cm. 26,6), 50 tavv. in splendida coloritura coeva allâ??acquarello. Legatura coeva in mz. pelle con angoli, nervi e fregi oro al ds. Cerniera anteriore lenta e tracce di usura soprattutto agli angoli. Rara prima edizione. London: T. Cadell and W. Davies, 1809. Leather_bound. Four volumes. Folio. First Edition. The Life of Admiral Lord Nelson, K.B. From His Lordship's Manuscript. By Rev. James Stanier Clarke F.R.S. librarian to the prince, and chaplain of his royal highness's household, and John M'Arthur Esq. LL.D the secretary to admiral Lord Viscount Hood. 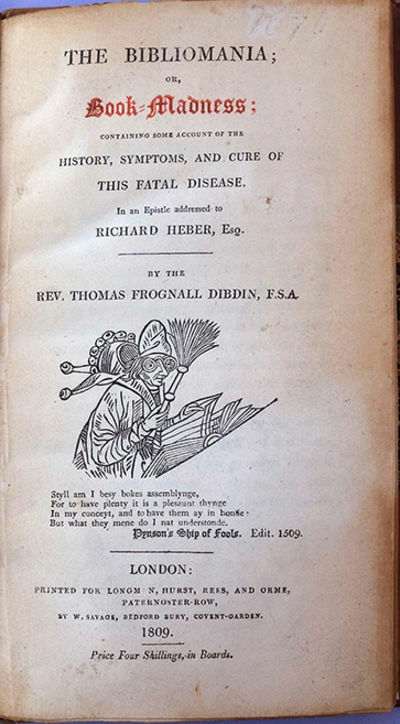 Published T. Cadell and W. Davies 1809, and illustrated by D. McN. Stauffer 1889. Extra illustrated and hand coloured of 517 plates included portraits, views maps, landscape, battle-ship, three original documents one by Lord Nelson wife signed and dated July 22, 1821, Frances Nelson Bronte. Other two documents are decreed order of power and payments to their Majesty, signed by Major General Oakes and Major General Villettes. Bound in three quarter navy blue crushed morocco between marbled boards, six compartments to spine of gilt decorations, gilt title, raised banding, to edge gilt, marbled endpaper. A Handsome and extra illustrated set. Fine. Vollständige Abhandlung über die Naturgeschichte, Cultur und Benützung des Mais oder türkischen Weitzens. REGNAUD DE SAINT-JEAN D'ANGELY M.-L.-E.
[Charleston, 1809. A fine copy. Charles B.J.F. de Saint-MÃ©min was a French emigree who came to America in 1793. In 1796 he began producing portraits using a physiognotrace, then transferring the image to an engraving using a pantograph. Each patron would receive the original, a series of engravings, and the original copper plate. Impressively true to life, Saint-MÃ©min's portraits were in great demand, and he executed some 900 of them, including many of the leading citizens of the republic, until he returned to France in 1810. This fine portrait is of William Drayton, not John Drayton as is sometimes asserted. 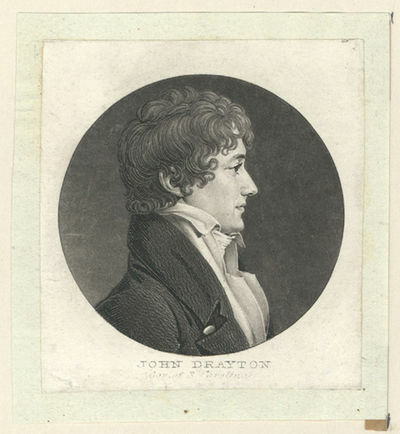 Although the caption bears John Drayton's name, the portrait is of a very young man, probably in his early twenties, and could not possibly be the stout governor who was in his forties at the time. A lawyer, William Drayton (1776-1846) became a colonel in the War of 1812 and later a prominent Congressman from South Carolina, and was an opponent of nullification. Miles, ST.-MEMIN (Washington, 1994), 275. Calcutta: Printed at the Hindoostanee Press, by T. Hubbard,, 1809. including Synonyma. 2 volumes quarto (234 Ã— 151 mm). Contemporary streaked calf, new red morocco labels to style, compartments formed by single gilt rules. 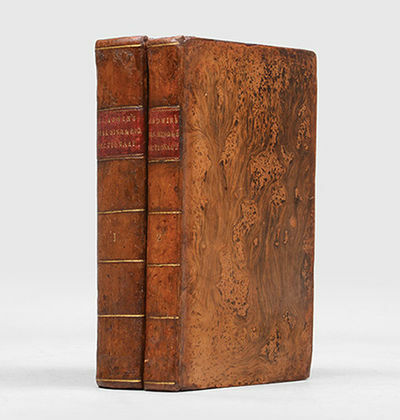 A little rubbed, particularly at the extremities, now with some judicious restoration at the joints, corners and head- and tail-caps, light tan-burn to the endpapers, pale browning else, a very good set. First edition. Decidedly uncommon, Copac recording just 5 copies - BL, Royal Asiatic society, Oxford, Cambridge and TCD - OCLC adding just 8 more world-wide. Just two sets recorded at auction. "Gladwin was a man of wide intellectual interests - he accumulated a remarkable librar - and with a passion for learning languages and for making translations, above all from Persian. He published a large number of his translations. In 1775 he produced a specimen of a 'vocabulary' of words in various Asian languages, a project that he was later to realize in several different formats Â…[this] stream of publications making him the most frequently published author in late eighteenth-century Calcutta. Gladwin was responsible for dictionaries and vocabularies, translations of Persian histories, collections of stories and revenue accounts, treatises on medicine and rhetoric, and a Persian version of an abridgement of the biblical history Â… None of this activity is likely to have been lucrative. Gladwin confessed to spending heavily in acquiring manuscripts. Publication costs in India were notoriously high and the market was very restricted. Success depended largely on the willingness of the East India Company to purchase multiple copies" (ODNB). Armorial bookplates of Coutts Trotter to the front pastedowns. Trotter had studied experimental physics under Helmholtz and Kirchoff in Germany, but is best known for "the indubitable improvements effected the administration of Cambridge during his short academic career. 'In fact, what was sometimes called in jest "the Trotterization of the University" was so complete that he had come to be regarded as indispensable'. Besides pamphlets on university topics, he published little, though his researches were extensive". Goethe's Lieder, Oden, Balladen und Romanzen mit Musik von J.F. Reichardt. Memoirs of British Quadrupeds, illustrative principally of their Habits of Life, Instincts, Sagacity, and Uses to Mankind. 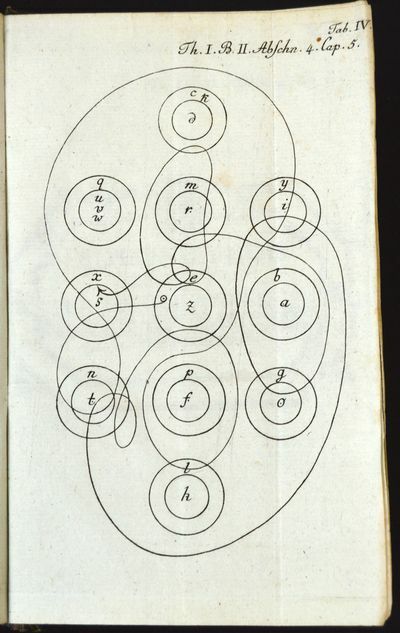 Arranged according to the System of Linnaeus. 71 engraved plates. [v]-xii, , 459, 70,  pp., one leaf of directions to the binder. Thick 8vo, cont. green straight-grained morocco (light foxing), gilt fillets round sides, flat spine gilt, a.e.g. London: Darton & Harvey, 1809. First edition and a most handsome copy. Bingley (1774-1823), naturalist, became curate at Mirfield in the West Riding of Yorkshire in 1799. "Bingley was a noted writer on botany, topography, and popular zoology. His travels in Wales while still an undergraduate formed the basis of his two-volume, illustrated, Tour of North Wales (1800; 2nd edn, 1814), which includes a catalogue of Welsh plants. He returned to Wales in 1801 and afterwards issued a topographical account, North Wales (2 vols., 1804). During the same period he published one of his most popular zoological works, Animal Biography (1802), which went through multiple editions and was translated into a number of European languages. In a similar vein he published Memoirs of British Quadrupeds (1809), and Animated Nature (1814). These works gave an entertaining and palatable introduction to the basic zoological facts."-ODNB. The attractive plates were engraved chiefly by Samuel Howitt from original drawings by Bingley. Apart from the minor foxing, a fine copy. Armorial bookplate of William Mayor and another of S.J. Wright II. .